Since moving to Vancouver, making friends with some of the healthiest health nuts and most experimental dietary-restrictionists has created a shift in some of the ways I fuel my body. One of the additions to my diet that this prairie girl didn't see coming was juice. I'm talking REAL juice; the kind that slaps you in the face with its nutrient-packed punch and leaves you feeling like a pseudo-superhero. After being introduced to the world of Kale and other extreme leafy greens, my curiosity overrode my eight year-old equivalent palette and I dove in. Well, drank it in, let's say. And, perhaps shocking to this sugar-fiend, I liked it - a lot. The past three days have been a whole other exploration into the world of juicing. I did the unthinkable over the May 2-4 long weekend: I juice cleansed. (pause for disbelief for my friends who understand my affinity for a crisp cider on a patio in the sun when there's a longer than usual amount of time available to recover from one or two too many of said ciders). 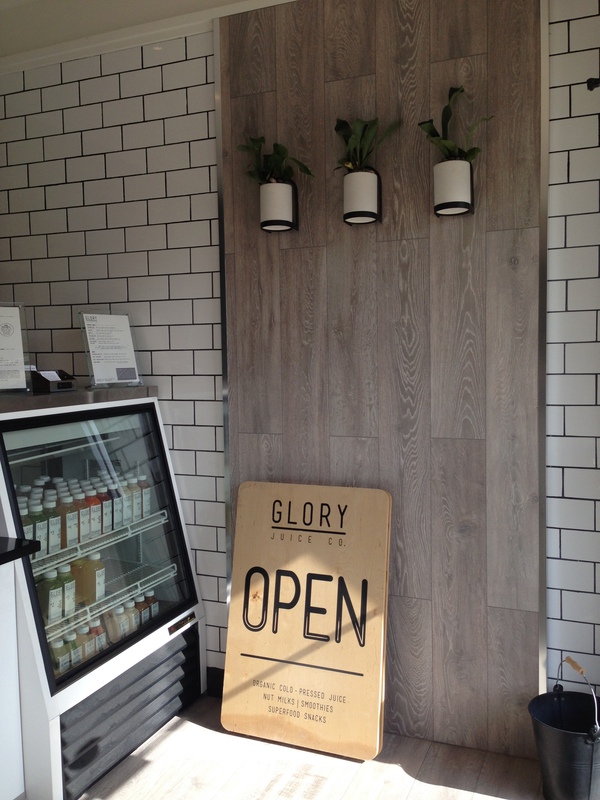 Three days of Glory Juice Co. juices awaited my consumption - as did a whole lotta life cleansing. Long and short, the three days passed with a strange sense of ease. The hunger pangs were much fewer than anticipated and the hanger (read: emotional outburst of frustration due to extreme hunger) reared its head only one time (I was alone - it was fine). What happened alongside of my body getting a real reset was a massive brain reset and a whole lotta life clarity. It takes trying on new things—new ways of thinking, new routines, new anything really—for me to gain a more clear and focused understanding of myself. Leaping out of a career got me connected to my true creative side. Travelling made me wise up to my passion for connectivity and relationship. This new thing—the cleanse—not only got me more aware of what was going on in my physical body, but also stretched me mentally and 'squeezed' some thoughts out of my head and heart that had been covered up by some doubt. Three days of a focused committment to one kind of 'detoxifying' opened up a wealth of ideas and productivity I couldn't have imagined would occur. Oh, and I managed to FINALLY clean off my desk. #win. I set some new goals, re-wrote some intentions that I had for this year and made some committments to myself that might just change up the game a bit. Now, whether said clarity is a product of the season or the fact that spending some solo time armed with a serious team of delicious detoxifying delights, I'm not sure. All I know is that my body and brain got a real kick-start this weekend and I'll be eagerly looking forward to the next time I hop on the juice-train for another sweet reset. And, next time, I'll plan ahead and keep the cleansing to the weekdays. Get Netflix. Clear your calendar, pop Downtown Abbey (er.....House of Cards?) on and settle in for a weekend series marathon. Drink every ounce of water you possibly can. Yes, you will feel like a hot water bottle with liquids slooshing around in your gut - but at least you'll feel full. Catch up on all that sleep you always say you're going to. Because what else is there to do? Take at least one bottle/jar with you on all outings. Not only will it create conversation with complete strangers but your hands will be full when you consider picking up that bag of Power Cookies at Whole Foods. Inform (warn) your friends. Always talking about sold food and moving as slow as a sloth....if these things are not already part of your personality, they may shock some friends if/when you start embodying these behaviors. Going to a lunch meeting with some sweet friends and watching them eat beautifully made stuffed portobello mushrooms. Teaching your very first yoga class. Standing up really fast in a repeated pattern at the very first yoga class you're teaching. Making a dinner date with someone you really like and are just getting to know.